Australia is to be congratulated for establishing the largest nursery in the world for humpback whales as well as protection for some of the most significant reefs in the world. 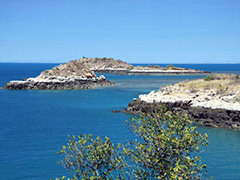 The plan for the marine park at Camden Sound on the Kimberley Coast has been heralded by Pew Environment Group and many other ecology and environmental groups around the globe. This revolutionary step by Australia offers sanctuaries as a ‘no-take’ area, with protection of key reefs in the newly announced park. Camden Sound is one of the largest bays and the waters will be home to the biggest nursery for humpback whales in the world. They are estimating that around 22,000 mother and young whales will be arriving and staying during the winter months in Western Australia. There are approximately 400 square kilometers within the Sound at Montgomery reef that encompass algal and coral reefs, supporting huge populations of turtles, fish, sharks, dugongs (a relative of the American manatee) and the Australian saltwater crocodile. The Great Barrier Reef has maintained a high level of protection for many years and now the Kimberley Coast area has been added. It was always a main concern that only one percent of the Kimberley Coast existed in a protected area. Those concerns are now gone as this new addition will help to maintain the rich diversity of life and preserve the ecological balance. This is a wonderful step towards ensuring a legacy of conservation in the long-term. The first step has been to include the traditional owners in a well-funded and negotiated management approach that involves a shard concept. This initial part is the main first focus for the success of the project. The next move will be via the Western Australian Government, in further protection of the marine areas in the entire region of the Kimberley waters as the Greater Kimberley Marine Park. This will be managed by Traditional Owners and will become Australia’s second largest, with the Great Barrier Reef topping at number one. Working with scientists and a network of professionals, the protection of the sanctuaries is the example that the world should be watching, to springboard other international plans. The Greater Kimberley Marine Park Premier and Environment Minister has shown true vision with this new plan and Australia has taken front and center as a main player in protecting the environment, wildlife and our oceans. Australia has already proven to have marine conservation as a focus, with the protection of the Great Barrier Reef. The Greater Kimberley Marine Park adds the title of international leader to Australia’s many accomplishments in this direction. Australia continues to be ahead of the curve when it comes to the topic of the environment and marine conservation. The foresight that the government is taking now will have positive repercussions for generations to come, offering pristine and protected areas for some of the world’s most beautiful and gentle creatures. We will all be watching in awe as the story continues and we see the fruit of much hard work and dedication.